Bread is never absent on a Spanish table. It is an integral part of any Spanish meal and comes in many different forms. This easy Spanish bread recipe is a very basic white bread that is perfect for a beginner at bread making. Flour, water, salt, and yeast are about all you need to make this delicious homemade bread. You can form this bread into a baguette (or barra as the Spanish say) or into one large round. If you divide the dough even more, it can make two mini-rounds. Measure water into a microwave-safe cup. Heat water in the microwave for a few seconds, until it is lukewarm. In a large mixing bowl, mix the yeast and sugar into the warm water, stirring constantly until both have dissolved completely. In a medium mixing bowl, mix the flour and salt. Using a wooden spoon, gradually stir the flour and salt mixture into the water and yeast mix. Stir in more water if needed, 2 tablespoons at a time, until a soft dough is formed. Knead the dough for 1 to 2 minutes to form a soft ball of dough. In a mixing bowl, cover the dough with a wet a dish towel. Place the bowl in a warm place away from drafts and allow the dough to rise for 40 minutes. Knead the dough 5 to 6 times. Form it into one large ball for a single round or divide into 2 pieces and form each into smaller rounds. To make a baguette, divide the dough into 2 pieces and form each into long, thick ropes of about 12 inches. Twist the pieces together and pinch the ends together. Place dough on a baking stone or lightly greased cookie sheet. Let it rise in a warm place for 15 minutes. Preheat the oven to 425 F. In a small bowl, beat the egg with 1 tablespoon water to create an egg wash.
Once risen, bake the bread for 7 minutes, then remove from oven and brush with the egg wash to create a shiny crust. Return to the oven and continue baking (about 13 minutes). The bread is done when it is golden brown and has a hollow sound when you tap on the bottom. Remove from the oven and allow to cool completely on a rack. 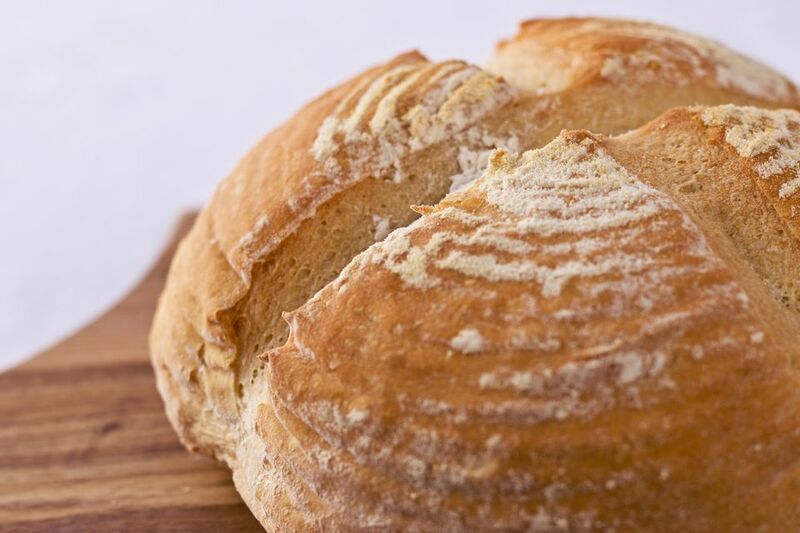 It's important to note that the conditions inside your kitchen, such as humidity and temperature, can affect the outcome of any homemade bread. The quantities of flour and water required to make a suitable dough may need to be adjusted. You might also find that these needs change throughout the year as the climate in your home shifts with the seasons.